Mathematics is not the topic most people would prefer as a film topic, right? Well, Matthew Brown, who directed, worked for 10 years with mathematics experts to insure the proofs and theories were correct and that the audience would not be bored with it all. Dev Patel, known from “Slumdog Millionaire”, “Best Exotic Marigold Hotel, “The Newsroom,” and “Life of Pi,” a star in his own short life, was a able to hold his own with Jefferey Irons, a cinematic giant, is a brilliant but crotchety old English Professor at Trinity College, Cambridge. Patel plays a young visionary Indian mathematician who grew up in poverty in Madras (now Chennai) India. He became a pioneer in mathematical theory recognized from his time in England. I was not thrilled at seeing this On Demand last night because of the title. But I was pulled in from the opening scenes in India. (DBell doesn’t think the temple was not in Madras, but never mind. It is a lovely Hindu temple somewhere in India! Maybe one of my Indian friends knows the location of this temple) Next are the interiors and exteriors of Trinity College, Cambridge which , too , are so beautiful. Soon the audience discovers there is insidious bigotry beneath the manners and setting of this beauty. I was touched by the transparency of the characters, the plot based on the true story of this Indian mathematician, Ramunujan, inspired by his spirit and forgiveness. There is family, friendship, suffering, vision, and people who are willing to change. I have to admit, I cried, wept really in this this film. My heart was truly touched . . . . but not with the math! * * * * * stars from me ! The full length film is available for free, I think, on YouTube.com or On Demand. Let me know what you think. 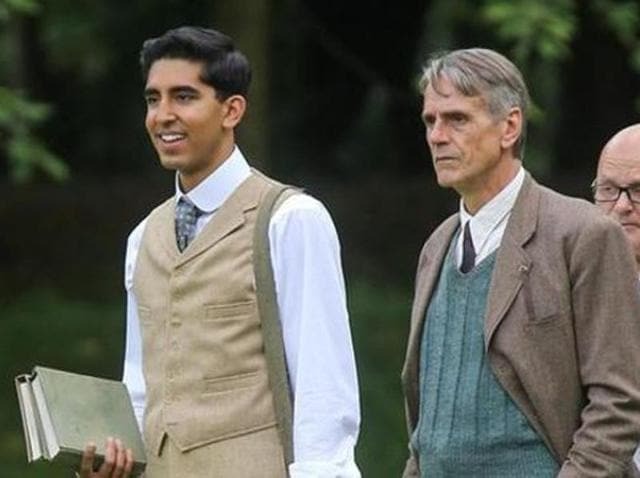 This entry was posted in Architecture, film, Religions of the World, Travel, Uncategorized and tagged "The Man Who Knew Infinity", Based on a true story, Cambridge, courage, Dev Patel, faith, family, film, friendship, Hindu temple, Indian mathematician, Jeffery Irons, Madras, Matthew Brown director, movie 2016, notebooks, Ramunujan, Trinity College, Wren Library. Bookmark the permalink. Honestly I was disappointed with the character development. Iron’s character was bery flat and superficial. There were so many ways he could have been developed more. Perhaps that was the pont in the end: the white man was superficial amdbthe mannof color could have deepened the white man’s growth as a human being had he been open to it. And sadly Foremthe story dragged on. Interesting. I read a review that said Dev Patel has played the same role in all his films. Actually, I saw growth in Irons final speech even acknowledging the possibility in God and in Patel giving up his drive for fame in math to return home to his wife and home! Well of course it might have been his need for a nurse! Thanks for thinking and sharing!